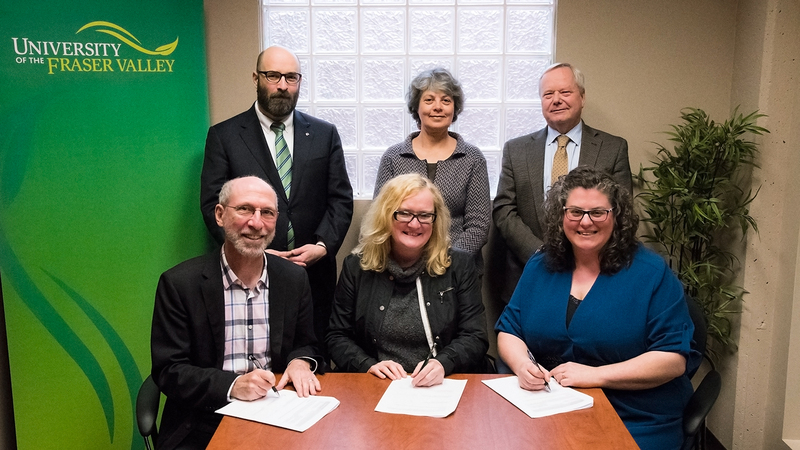 Students at Langley’s Catholic Pacific College (CPC) who complete their Liberal Arts diploma will soon be able to transfer to UFV with credit thanks to a recently signed agreement between the two schools. CPC grads will be able to enter the Bachelor of Arts or the Bachelor of General Studies degrees at UFV with full credit for their core coursework. The skills and knowledge acquired through the CPC program reflect the core values and skills of a Liberal Arts education: critical thinking, quantitative reasoning, scientific literacy, written and oral communication, creative thinking, teamwork, integrative learning, ethical reasoning, and civic engagement. This lines up well with the revised UFV BA and the BGS. “We’re excited to be collaborating with CPC on this initiative. Their Liberal Arts students will bring a strong skill-set to UFV and these skills align well with our revised Bachelor of Arts and Bachelor of General Studies degrees. CPC students will benefit from these pathways as they move from diploma to degree,” explains Alisa Webb, UFV Associate Dean of Students, College of Arts. These agreements were approved by UFV’s Undergraduate Education Committee and are effective September 2017.